If you haven’t already figured out, my planner is basically my most prized possession. Correction: my *planners* are my prized possessions. As I mentioned in my Picking a Planner post back in July, I’m currently using two planners at once: my Day Designer and a bullet journal. 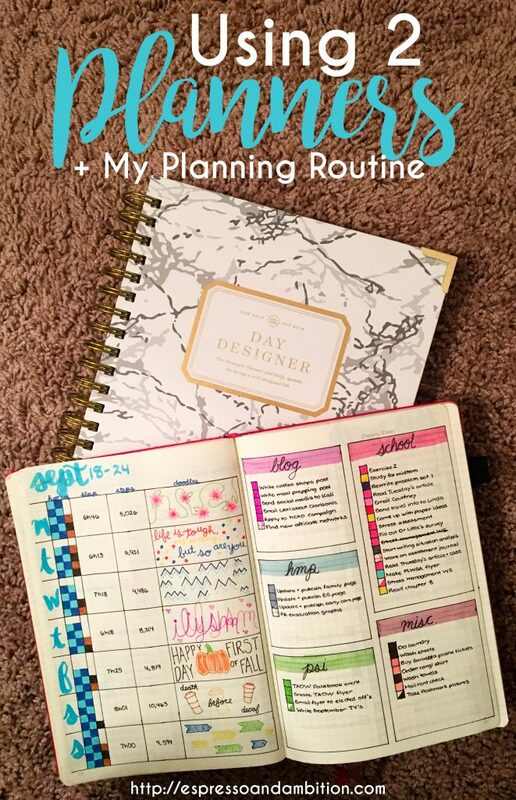 Anyways, for today’s post, I thought it’d be fun to walk through my planning process and show how I’m able to use two planners to maximize my productivity and organization. Between a blog, work, school, an internship, and clubs, staying on top of everything is key. 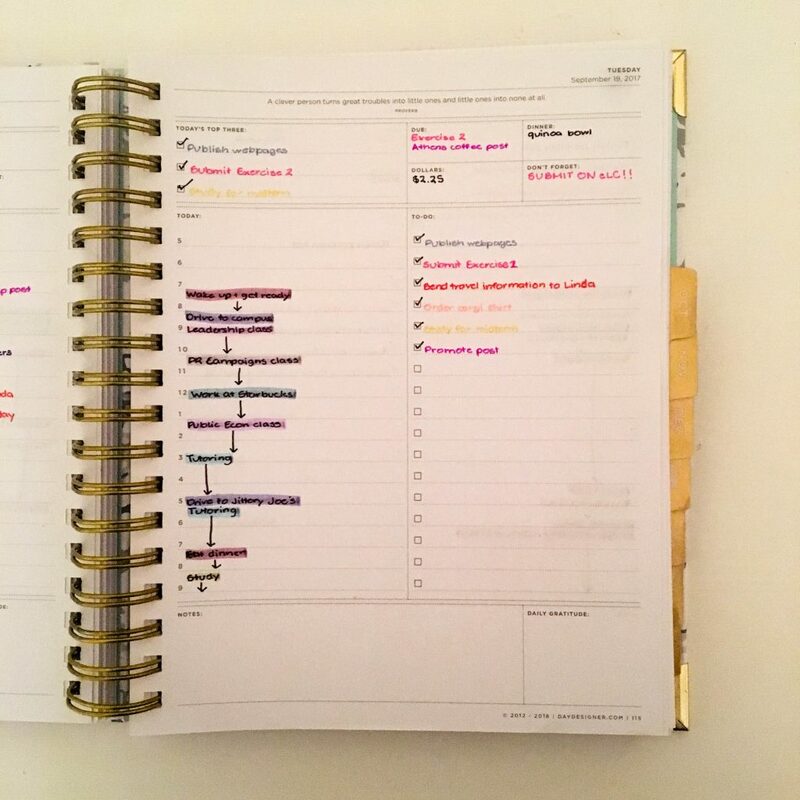 The main reason that using 2 planners works so well for me is that the planners themselves don’t really overlap. My Day Designer has a monthly spread and daily pages, while my bullet journal has a yearly overview and two weekly spreads. This means that there isn’t a ton of unnecessary overlap – having these different spreads means that I can see my life planned out in a variety of perspectives. I’ve got the zoomed-in version in my daily pages, and the zoomed-out version in my yearly pages. It’s just different enough to be valuable. Despite having two planners, I only carry one around with me. Since my Day Designer is kind of bulky (and also so pretty that I’m scared of it getting messed up in a bag), it lives on my desk. I keep the page of the day facing up so that every time I sit at my desk or pass by it I’m reminded of what needs to get done. My bullet journal, on the other hand, goes everywhere with me. It’s a much more portable size, which is incredibly helpful when you’re carrying a heavy backpack everywhere. The only major weekly planning thing I do is my bullet journal layout. I’ll usually plan to spend about 15-20 minutes getting the whole layout set up, and then I’m good to go for the rest of the week. When I do this, I also like to write in all of my to-do’s for the week that I already know about – it makes planning out what needs to get done on a day-to-day basis so much easier. I like to do my planning either right before I go to bed or first thing in the morning. 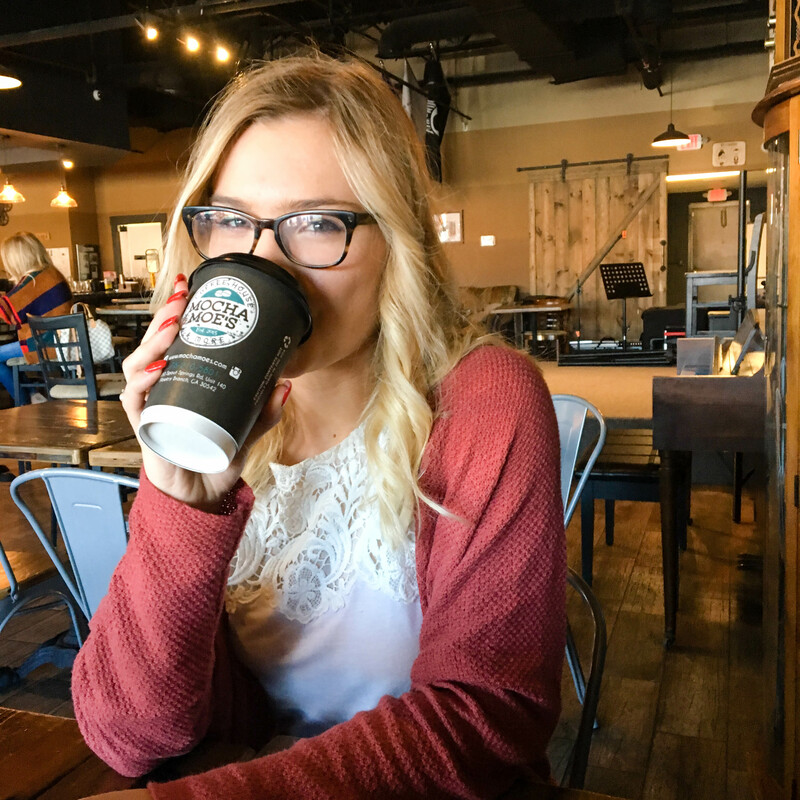 It usually depends on my schedule – if I have an early morning workout class, planning gets done at night; if I have a more leisurely morning, I like sitting down in from of my planners with a cup of coffee to get me going. I start a planning session with my Day Designer. The Day Designer website has a much more detailed method of planning out your day, but my routine is pretty simple. I write out what I’ve got scheduled for the day on the left, and fill in my to-do list on the right. Then, I pick my top 3 to-do’s and write those in. I now have a clear strategy of what I need to put into my bullet journal. Now I go into my bullet journal. Much like my Day Designer, my bullet journal breaks things down by hour. However, I use my bullet journal to track tasks instead. For example, if I know that I’m planning to work on homework from 6-9, I’ll write that in my Day Designer just like that. In my bullet journal, I break it down by task. I’ll spend the first hour working on an assignment for economics, and the second and third hours working on my public relations campaign. This keeps me productive and prevents me from sitting down to do work and getting overwhelmed because I don’t know where to start. Since I carry my bullet journal with me as well, I’ll also update it throughout the day. I’m a huge fan of this system and it really helps me feel like my life is more put-together. Juggling everything that I do is definitely a balancing act, but having two planners to record everything saves me time and time again. I love reading the different ways people plan! I personally use a bullet journal & it’s my absolute favorite. 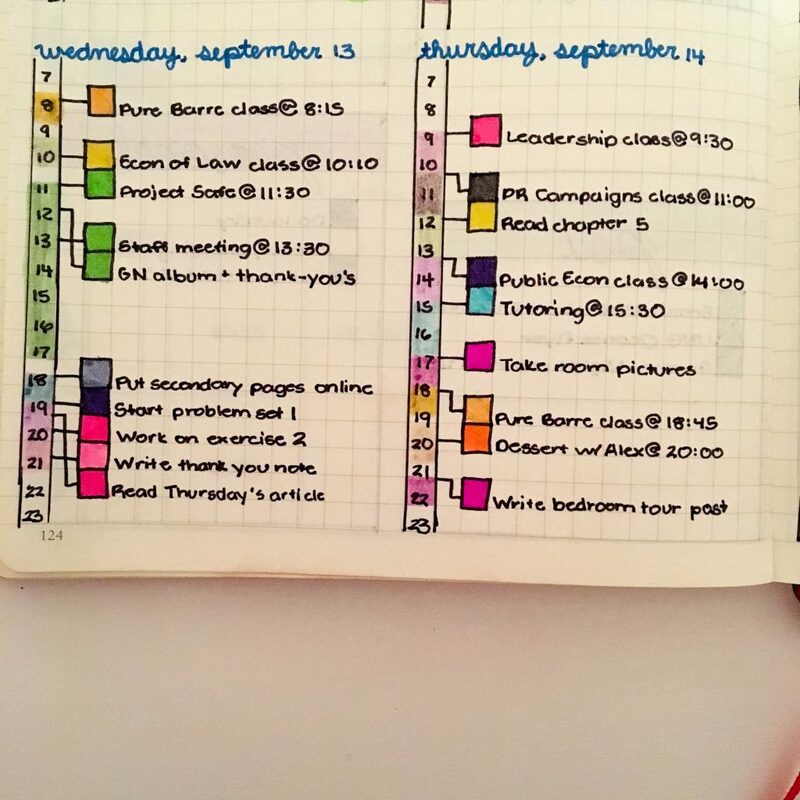 Thanks for sharing how you organize yours! I’ve always wanted to try a bullet journal (let’s be real I’m OBSESSED with planners too!!!) but I’m super intimidated/don’t know where to start/not really artistic haha But I love the idea behind it and the organization. Any tips on how to just get started with a bullet journal? Thanks girl!! 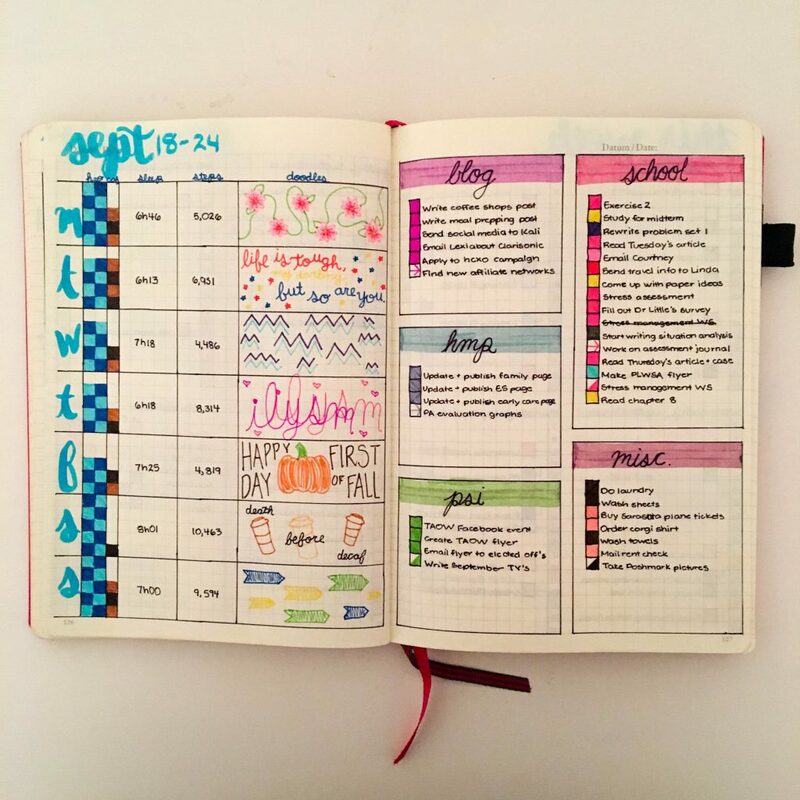 I have SUCH bullet journal envy! I totally failed at BJ-ing but I use a paper and pen planner for big commitments like if I have tickets to a concert or a doctors appointment. I think write out a weekly and daily to-do list. During especially crazy weeks I’ll use g-cal to visualize my day hour-by-hour. I just started a bullet journal and after using so many different planners, I’m finding the bullet journal is so much more flexible with my schedule. This is such a helpful post and I know I’ll be referencing it! Thank you! Loved this! I love seeing other people’s planners. What highlighters do you use in the day designer? Also, unrelated to this, but I say in your LSAT post where you used the powerscore self study method. Did you buy all 9 books, just the bibles, or some of each? I use Mildliner highlighters! I think they’re linked on one of my bullet journal posts 🙂 also, I bought all 9 books but honestly didn’t use the workbooks all that much – the bibles and the type training books were so useful though! !